The 2SP-PCI offers an efficient way to utilize PCI slots and system resources with reliability and performance that is second to none. With one 2SP-PCI you can double your serial ports and add one enhanced parallel port (EPP), while using only one system IRQ. The 2SP-PCI’s two 16550 UART serial ports enable high-speed transfer rates when connected to any serial peripheral. 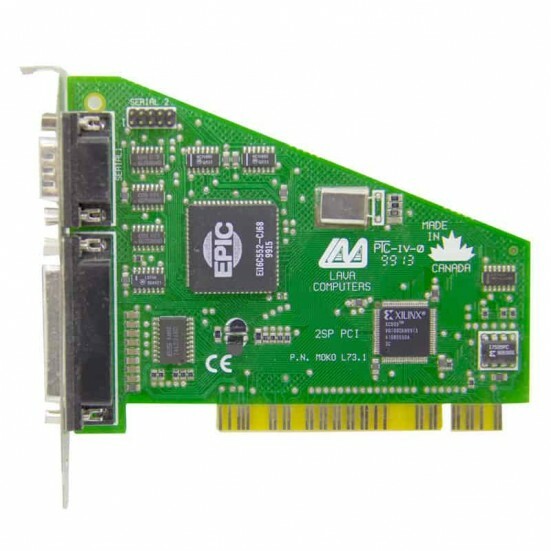 The board incorporates the LAVA PCI EPP technology, enabling data transfer rates up to 3 times faster than standard ISA or motherboard EPP ports. The board requires an extra cable for the second serial port. Few serial and parallel peripherals or PCs would not benefit from the 2SP-PCI’s speed and economical use of PCI real estate, IRQs, and COM port resources. Connecting Lava’s 2SP-PCI to any serial and parallel peripheral has never been easier! This unit is very handy when you need to add a standard Parallel Printer Port to your PC for controlling devices such as a CNC. Pulled from a working system and should be considered as used.